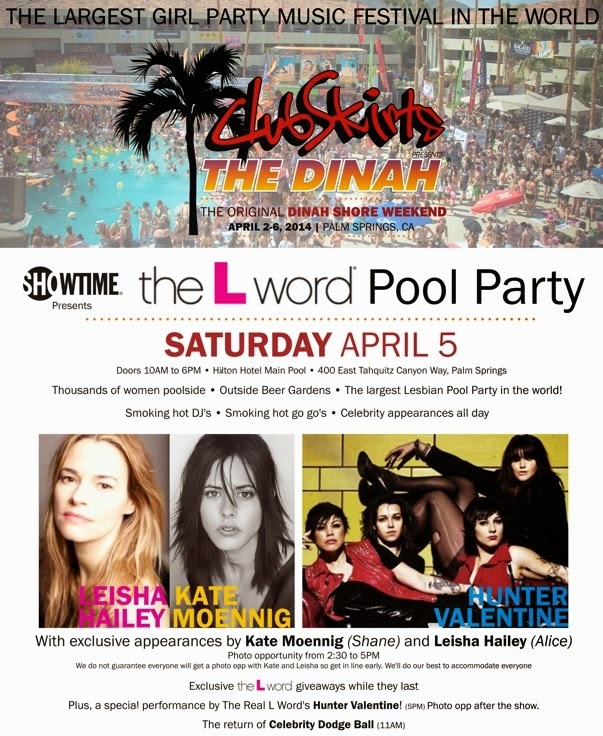 Club Skirts Dinah Shore Weekend, in association with SHOWTIME, is bringing back the magic of the hugely popular, groundbreaking lesbian drama, The L Word, with an exclusive “L Word” pool party during the legendary Dinah Shore Weekend in Palm Springs, CA. On Saturday, April 5, 2014, The L Word stars Leisha Hailey and Kate Moennig will, respectively, step back one more time into their famed Alice Pieszecki and Shane McCutcheon shoes for an exclusive meet and greet hosted from 2:30pm to 5:00pm at The Hilton Hotel. Fans will also be able to catch them on the red carpet at the Dinah’s “Black Party” held later on Saturday night at the Palm Springs Convention Center. Dinah attendees will have the once in a lifetime chance to take photos and get their favorite L Word memorabilia autographed by two of the most popular characters of the beloved, critically-acclaimed television series. In addition, limited edition The L Word swag will exclusively be given away throughout the event courtesy of SHOWTIME. Since the show ended its five-year run on March 8, 2009, both Kate and Leisha have been keeping busy entertainment careers. 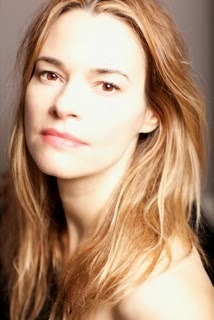 Kate is currently starring on the hit series on SHOWTIME Ray Donovan, playing the role of Lena –one of Ray’s associates. She’s also filming “My Dead Boyfriend”, a film based on Arthur Nersesian’s 2000 novel Dogrun also starring Heather Graham, Gina Gershon and Angela Featherstone. As for Leisha, she’s still making music as one half of the acclaimed electropop duo Uh Huh Her and is getting ready to release the first single off “Future Souls” dubbed “Innocence” available February 4 on iTunes. As this year marks the 10th Anniversary of the official television debut of The L Word, Club Skirts and SHOWTIME are proudly commemorating the nostalgia of a memorable era in lesbian culture that celebrated out loud our “girls in tight dresses who drag with mustaches”! SHOWTIME has been a long-time supporter of the LGBT community with programs like The L Word and The Real L Word®, and has developed over the years a close relationship with Club Skirts Dinah Shore Weekend. The Dinah served as the focal location for both series. We all remember Shane, Alice, Jenny, and Dana eventful roadtrip to The Dinah, the biggest lesbian event in the world, in Season One. Likewise, The Real L Word shot episodes of Season One and Two at Club Skirts Dinah Shore Weekend and notably dedicated two back-to-back full episodes to the event in its third season. Speaking about The Real L Word, the reality TV show will also have a prominent presence at the highly-anticipated Pool Party with a live performance by Season 3 cast members, Hunter Valentine. The all-female Power, pop/punk band will take the stage at the Hilton Hotel at 5:00pm and will close the massive Pool Bash with a special meet & greet. Countdown to Dinah has started! The epic five-day world-renown weekend is already making a lot of noise and is well on its way to be the biggest Dinah EVER. … this is going to be an unforgettable year! Posted on February 6th, 2014 by Mariah.